We are a little over two weeks out from the 28th annual running of our Grand Prix event. The event will once again take place at Buffalo Bill’s Casino and Hotel at Primm, Nevada. 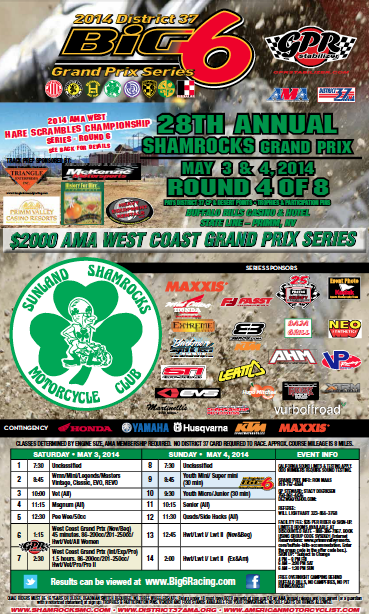 This year the Shamrocks will also be hosting round 6 of the AMA West Hare Scrambles Championship Series. As usual there is free camping behind the Casino. And for your extracurricular racing activities, the opening round of AMA Endurocross will be at the Orleans Arena in Las Vegas on Friday night along with the final round of AMA Supercross on Saturday night at Sam Boyd Stadium in Las Vegas. I’m sure we can also get the Casino to put it up on the TVs at the Tree Bar inside Buffalo Bills.